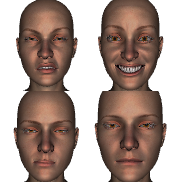 This is a set of 10 facial expressions for Genesis 2 Female: Blah, Bleak, Forced Smile, Hah Hah Hah I Hate You, Not Funny, Pissed, Pout, Sad02, Start Panicking and That Looked Painful. Use them when G2F needs to make sad, mad or bad faces. Your work deserves 10 all of it. Vashima (5 years ago) Inappropriate? Such negativity ;-) . Thank you very much.